Our front door has never really come together the way I would like and it has been kind of neglected and unloved. But I decided this fall would be the time to finally pull together a welcoming entrance to our home. This is where I started, snore snore bore bore. I do have flowers out front, but I keep them on the walkway so that they can be watered by the rain. If flowers have to depend on me, it doesn’t usually work out so well. Hopefully the mums I have added will make it. I did actually water them yesterday so that is progress. These are the items I started with – a rusted old pumpkin candle holder, three rusted candle lanterns, an extremely rusty and dirty old birdcage and a metal thingy-ma-bob. I have no idea what the metal round thing is suppose to be – my daughter’s best guess was that it held propane tanks which I thought was a good guess. I however looked at it and thought it would be great to hold wood for the fireplace right by the front door. The birdcage now holds gourds and a ominous crow to greet trick-or-treaters. The milk can was spruced up and mason jars and candles were added to the lantern holders. I finally have a front entrance I can be proud to welcome family and friends through. 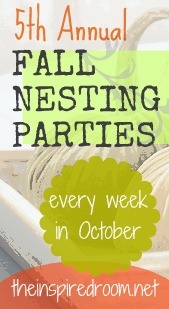 Fall in Love with Spray Paint Link Party. To learn more about the other ladies’ projects, stop by their sites, but here are their sneak peeks as well..
As always, thank so much for reading. It’s really beautiful! 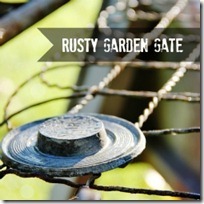 What a great use for your metal thingymabob–love the wood in it! Gorgeous welcome to your home! Love it! Great entrance decor! I agree with your daughter on the thingymabob…Smart girl she is! Very Welcoming! Looking forward to tomorrow’s party! Gorgeous! Like something out of Better Homes and Gardens! I love this, Laura. What a welcoming front door~it makes one imagine coming inside to a crackling fire, a good visit and a cup of hot chocolate (or tea or coffee!) Good job! Your porch looks amazing. I love the stacked wood – I pinned it to remind myself to copy you….hope you don’t mind. it is awesome! I love all the cool vintage elements that you brought together and look so cohesive, rather than a hodge podge. PS read your post at incourage and enjoyed it a lot-our family is also going through our own spiritual journey, mainly triggered by our girls starting in Christian school. It’s been interesting to see where this has taken us, and will be interesting to see how this evolves for our family. It looks fantastic Laura!!! I am ashamed to say I still have my summer decor, shells and sand out, I just haven’t gotten into fall, and it’s my favorite season! 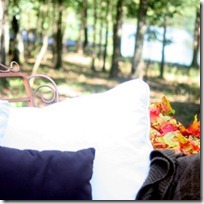 Your fall porch makeover looks so great. I just love all the items you painted. The wood holder is very clever. Such a warm welcoming look. Your porch is amazing….I expect to see it soon somewhere is a magazine…it is that gorgeous!!! Love the contrastts. Firewood . . . baskets . . . color . . . lantern. So very cozy, warm, and inviting. I love this! Gorgeous, gorgeous! SOOO lovely and inspirational!! Thanks for sharing. seee more, thanks for the information! I know this post is nearly four years old, but I just discovered it from a link in Pinterest – so, it is like new to me! What a wonderful transformation – and with only a few items!!! I am totally inspired to revamp my Fall Porch, as I have gotten into the same rut the last few years and turned into a creature of habit. 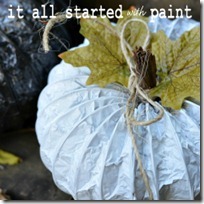 Time to shake it up – and grab a can of spray paint to breathe new life into some odds & ends.